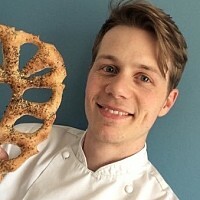 Jack has been helping the people of Surrey bake amazing bread at home since 2013 via his bespoke private bread making courses and workshops at the Mayford Centre in Woking. He regularly demonstrates at food festivals across the South East and his recipes have been featured in Time and Leisure magazine, Surrey Occasions, the Surrey Advertiser and the Sunday Express ‘S Mag’. Check out Jack’s weekly bread-making vlogs on his website.